Its ruler was once the world's richest man, and it's again turning India's richest city. Hyderabad's timeline promises to stay fascinating. To understand Hyderabad's history, you'd have to know something about India's history as well. Yes, that's as discouraging an opening line as one can give to an article on the history of Hyderabad. Fortunately, we're planning to keep this one crisp and effective, so that you're still interested after every 5 seconds. And if it all fails anyway, there's the rest of fullhyd.com. Hyderabad's present is even more interesting than its past. Once upon a time - say 1000-1200AD - a dynasty called the Chalukyas used to rule a large chunk of South India, and thus the area that is now this city. There wasn't any city then, of course - it was just jungles with panthers prowling around. Our landlord says he even saw some when he first came to this area, and we strongly believe he was alive at that time, and that he will never die. If you've read enough history (okay, sorry to have brought that up), you will know that every dynasty comes to an end, and that it is usually because of a woman. Okay, ignore that last part - the only woman we know who is capable of bringing a dynasty or even a whole city to an end has fortunately stopped acting in Telugu movies, and we locals are starting to enter the theaters again. So the Chalukya dynasty ended around 1200AD and the Kakatiya dynasty took this area over, ruling from Warangal, about 180km from Hyderabad. Around 1320AD, Mohammad Bin Tughlaq from Delhi invaded the Kakatiyas and everything got messed up after that, which resulted in the Bahmani Sultanate that operated from what is now Karnataka, slowly taking over the area, fighting neighbouring empires. By about 1450AD, they were undisputed rulers. Yes, people fight a lot over land. They still do it in Hyderabad. To claim that a piece of land is yours in Hyderabad, for example in Madhapur or Shamshabad, many times you still need an army, even if you have all documents. The Bahmanis sent a person called Quli Qutb-ul-Malik to this area in 1463, to quell	some anarchy. He succeeded, and the Bahmani Sultan of that time made him the head of the area, in a decision he would rue for all time. The general rule history teaches is, you should never make anyone head of any area. This Quli Qutb-ul-Malik is the founder of the Quli Qutb Shah dynasty, which in 1594 built Hyderabad, and had seven generations rule the city before Aurangazeb attacked. Quli Qutb-ul-Malik operated from a fort built by the Kakatiyas called Golconda - it's still called that, is south-west of Hyderabad, and is a major tourist destination - which he buttressed. By 1500AD he had become virtually the ruler of the area, and went ahead and declared independence from the Bahmanis in 1518. Declaring independence is a bold act, and Quli Qutb-ul-Malik took his time and had an army. If you are planning to do that, remember to seek professional help. Anyway, Mohammed Quli Qutb Shah of the Qutb Shahi dynasty founded the city of Hyderabad in 1589-94 south of the Musi river, 8km from the Golconda fort, and built a bridge over the river to connect the fort to the city (it is now called Purana Pul). It is rumored that he built it mostly to meet his girlfriend Bhagyamati. It's a surprise nobody attempted it since then, given all the illegal constructions about town. Maybe you'd ask why anyone would build an illegal bridge of all things. Well, some people in this city will build anything if it's illegal. The city was originally called Bhagyanagar after Mohammed Quli Qutb Shah's wife Bhagyamati, and prospered under the Qutb Shahi dynasty, in the 16th and 17th centuries. It became popular as a hub of diamond and pearl trading, and lore has it that pearls would be sold spread out on the streets. Mohammed Quli Qutb Shah also constructed Charminar in 1591 reportedly as a tribute to God's help in avoiding an epidemic, a huge structure with 4 minarets that symbolizes Hyderabad in many places and publications even today, and is a must on the tourist itinerary. We already told you the golden rule of history. 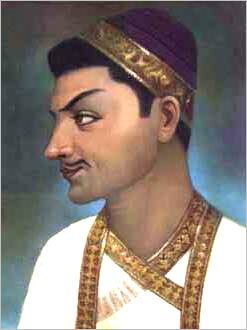 Sure enough, Aurangazeb died in 1707, the Mughal empire weakened, and the governor of Hyderabad, Asaf Jah I (titled Nizam-ul-Mulk by the Mughal emperor), declared independence in 1724. His line ruled Hyderabad until 1948, and were called the Nizams. While Asaf Jah I ruled from Aurangabad, his son and successor Nizam Ali Khan shifted the capital to Hyderabad, and a glory period started. There were 7 Nizams that ruled Hyderabad. And they did a pretty good job - town-planning, economics, culture, everything saw their stamp. The city was peaceful, and became richer and richer, with the last Nizam, Mir Osman Ali Khan (who built Osmania University and Osmania General Hospital and named them after himself) being named the world's richest man by Time magazine in 1937. 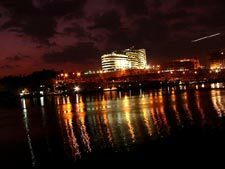 Hyderabad stayed a more-or-less also-ran city of India until the late 1990s, when Chandrababu Naidu of the Telugu Desam Party took over as CM. An ambitious visionary, he caught on to the wave that was changing the world, and attracted the world's best software companies to set up bases in Hyderabad - Microsoft, Google, Oracle, Infosys, Satyam, TCS, Wipro, Vanenburg, D E Shaw and just about every big name was in Hyderabad, sky-rocketing it to the Silicon Valley of India. Lakhs of youngsters from the city have seen their lives transform with the revolution, and their earnings and dignity manifold compared to those of their counterparts of a decade earlier who would get to sit in musty purchase offices of family-owned mid-tier businesses with a BSc degree and see life atrophy with gutkha, or get onto a shopfloor with a B Tech if they were not lucky enough to escape abroad. Naidu also helped set up world-class institutions in ISB and IIIT that put Hyderabad firmly on the global map. A city known for Irani tea, Charminar and pan stains was sporting swanky offices where you had to swipe cards to enter and got free soft drinks, more and more youngsters had suitcases with international airline clearance labels that they understandably would not take off for a while, and soon there were multiplexes that charged thrice the normal fares as local theaters, and ran full shows all the time. Hyderabad's transformation over the 2000s has been astounding. Sleek air-conditioned malls, plush movie theaters, global marquee brands with dedicated outlets, slick new restaurants opening every week, coming of age nightclubs, swank multiplexes, full front-page ads for gated communities, and a growing expatriate community are symbols of a one-way street. Land prices have understandably sky-rocketed, in a sure sign that the city is reaching the business end of its history. In 25 years, Hyderabad will probably showcase an overindulgence in SUVs, accessories and McMansions. As for the traffic, it's a small price to pay for that. We're enjoying the ride. I have come across a good novel which talks of Hyderabad. It is Theft of Nizam's Gold. This talks more of the history in a very effective way. Every Hyderbadi shall read it. It is written by a writer from Hyderabad (Naser Banaqeeb). The interesting thing is he has, on acknowledgement page of his novel, clearly thanked for the people of Hyderabad who he said has helped him in creating this wonderful novel. That is really great. It shall be read by all Hyderabadis. The novel is available online at Amazon. The novel is published by Authorspress New Delhi. Thanks a lot. only fullhyd can write about the history of hyderabad so funnily. and yes, i'd love to meet your landlord!!! fullhyd.com has 700,000+ monthly visits. Tell Hyderabad what you feel about The Hyderabad History!